You can download this app from iTunes or the Android Play Store, just search for "Strowger Inventory". Now press save at the bottom of the page. Click the area at the top of the screen that says "Please touch here to add Barcode". This will launch a bar code reader. Point it at any barcode and it will record the barcode. Capture as many barcodes as you want. The GPS location will be recorded when you press "send", so be sure to send the email before you leave the install site. There are some additional free-form fields that can help you remember this install. Use these fields any way you like. 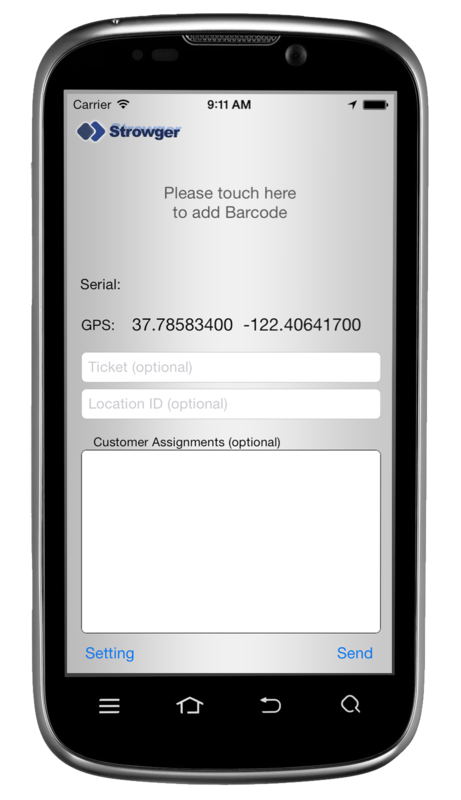 Record the ticket number you are working on, the route and ped number and information about the customer assignments in these fields. Please turn Wi-Fi on when you want to use GPS coordinates. The real GPS services need functions provided by the Wi-Fi feature to get an accurate fix on your location. If you have Wi-Fi turned off, you will only get a vague location based on proximity to cell towers that might be miles off from your actual location.